HEY APATHY! The strange Art show “Of Pigs and Poverty” was inspired by all the weird, primal and somewhat terrible characters inhabiting the monstrous metropolis. These artworks were created while investigating the streets, cafes, bars and night clubs in and around the city of Toronto. The imagery combined human and animalistic features rendering people as pigs, vultures and mythological monstrosities. Dark creatures wearing their skeletons on the outside could be seen riding bicycles while landlords and drug dealers continuously attempt to ingest their clientele. The characters were primarily depicted in moments of greed or aggression emphasizing the city as a jungle and the darker sides of humanity (very likely reflective of the artist’s own nightmarish experiences wandering the metropolis). The smaller monster drawings were all made using an acid free sketch book and two different sized technical pens. The process involved two stages, a quick left handed sketch using thin lines followed by thicker and more detailed right-handed renderings. The initial stage using the artist off-hand allowed for more fluent and imaginative creations foregoing the practiced control which was developed through years of illustrative studies. It was also common practice for these works to be drawn in various public locations as opposed to the previous series’ which were all made inside the artist’s studio. The exhibition featured 6 large ink on paper works and approximately two-hundred 8.5 x 11” sketches presented on black walls with painted red floors and ceiling. “The Basement Gallery” was actually my Kensington Market art studio. 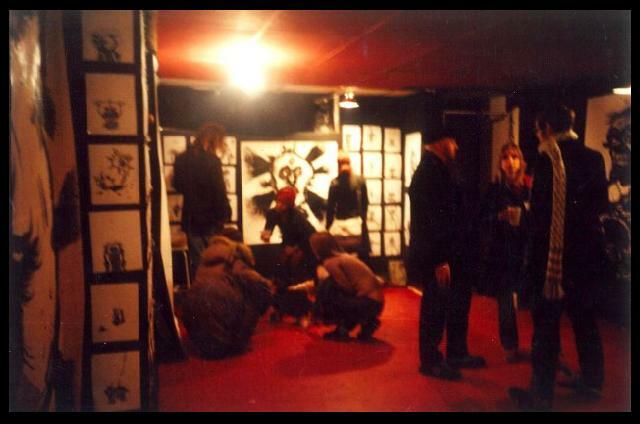 The work space often doubled as a gallery and hosted several group shows and all night parties. Open call events invited anyone and everyone to participate offering free or discounted drink tickets to people who put art on the walls. Featuring live music, performance works student and professional artists, the Basement Gallery always had paper and drawing tools at the door giving everyone a chance to participate. “Of Pig’s and Poverty” was the only solo exhibition at the Basement Gallery before it’s demise in the spring of 2004.